Jordan was originally born in the quiet town of Hamilton, New Zealand but moved to Brisbane, Australia at the age of three. Though he spent the majority of his life in Australia, he identifies as a New Zealander and attributes the country’s music - along with classic pop and R&B from the US - as a major influence in his own sound. His mother (New Zealand born) and father, a Pacific Islander hailing from the Cook Islands, played an important role in shaping Jordan’s musical DNA, often playing vintage American soul, Frank Zappa, and Pink Floyd in their family home when Jordan was a child. Such exposure led him to the piano and later to beat-making, two elements that would become touchstones for his career as a producer, songwriter and instrumentalist. Already having furnished a name for himself collaborating with Taku, Tom Misch, FKJ, and lending vocals on ‘Masterpiece’, from Disclosure’s 2015 album “Caracal”, Jordan’s new perception of himself and his music caught the attention of an even wider peer audience. He became close with many of the figures in the South London scene including Bradley Zero , founder of the dance label and party Rhythm Section, who encouraged him to try his hand at a collection of dancefloor driven tunes. These tracks became the EP “Joy, Ease, Lightness”, released by the label in late 2016 under the alias Dan Kye and which received support from the likes of Bonobo, Mary Anne Hobbs, Gilles Peterson, Mixmag and more. Though he’s enjoyed the kind of success and respect many artists spend the length of their careers building, Jordan isn’t resting on his laurels. Having just signed to Ninja Tune , he released his second LP in September entitled “Wallflower”, a genre-bending and personal exploration of ego and anxiety which sees Jordan edging beyond the peripheries of the often sun-flecked sound his fans have come to know him for. That he can radically shift his approach in both lyrical style and musical aesthetic is a testament to his sheer talent as a musician with seemingly limitless room to grow. Let’s start 2018 right! 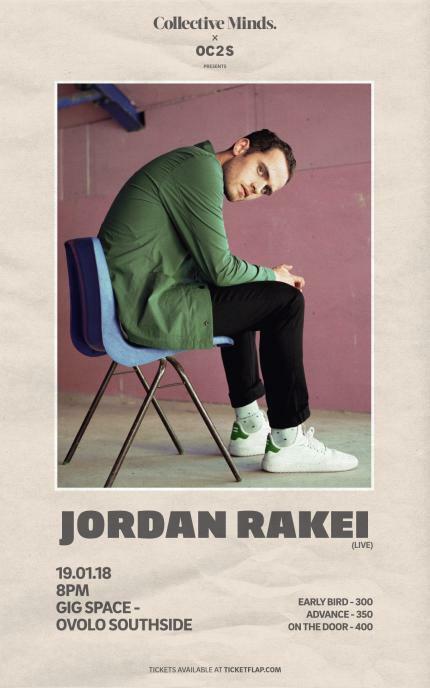 Join us at Ovolo Southside on January 19th for what’s going to be an incredible evening of live music with the super talented Jordan Rakei.